Best Office Shifting Services Provider Company in Dhaka Bangladesh with Professional Labor and Technicians. The thought of office relocation may be menace. but with proper planning any size office moving can go flatten. 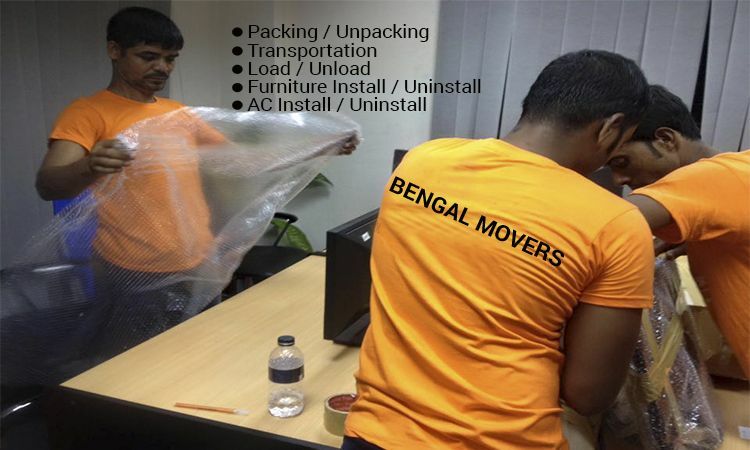 Bengal Movers is one of the best office shifting services provider in Dhaka, Bangladesh. The objective when relocating office equipment’s, office furniture’s, cubicles, phones, computers and laptops is to minimize disruption in the workstation and swiftly come back to normal levels of efficiency and workflow. While no two office moving assignment are similar there are basic activities that need to be arranged and managed to ensure perfect implementation. Our experienced staff of business moving services project managers can assist you every step of the office moving services. Working as a team with you and your employees will promise that all periods of your office relocation are covered, plans are made, procedures carried out and timelines met. There are thousands of small details to be attended to;Bengal Movers ‘ experienced and utmost dedicated staff will make unquestionable nothing is left to chance. Extent of Services Facility relocation’s normally take location after normal work hours and on weekends. We will work with your move coordinators to establish a unique office relocation plan, including office moving succession, time line objectives and key roles and responsibilities to ensure a successful office move. When you ask Bengal Movers to quote for your office shifting services one or a team of our professional consultant will visit your office to survey your office items. He will review all of your belongings and make an inventory and also make a short list and mark the items which items are sensitive or breakable, which item needs extra packing. You will get a moving quote according with a moving plan, services, supplies based on your moving needs and your requirement. We always try to provide you as more moving resourced as possible to us. We want to make your move easy, stress free and fit to your budget and requirements. Our special packing and shifting options helps you to decide how much office shifting services do you need to complete your office move successfully within your budget and time frame. Complete, Partial or single item packing service. Any type of A/C uninstall, servicing and re-installation. Projector, LCD or LED open and re-setup services. Post move follow up to ensure completion of all items. Bengal Movers offers a full row of office shifting services to remove and or take apart your existing office furniture’s and fixtures, computer equipment, including server rooms, and any other related supplies from your old location. Our expert and professional movers will transport your items to the new location and place them according to the direction of your facilities. Here is our comprehensive packing and moving options that will help you to plan and prepare with ease. Full Service Packing – Our expert packers team will pack your entire office items by using modern packing materials and latest method. Each member of our packers team is professional, specially trained, expert and utmost dedicated. They will pack your entire office with professionalism and expert care. Fragile Packing – Some items are breakable and irreplaceable in value. Please let us inform about that item so we can pack them with extra care. We always treat your office items as our own. Nothing to worried at all because your move is in safe hands of qualified moving experts. Loading – Prior to loading the moving truck our professional movers team will make sure that all the office belongings are packed properly. All the items are listed for inventory and put labeled for moving. To guard against dirt and scratches we use plastic durable Stretch wrap. We also use special packing materials to protect any damage of your belongings during the shifting. Transportation – Safety is the first priority to us. We ensure the safety of your office belongings. Our drivers are experienced and licensed. They are very expert to drive heavy moving trucks on highway, busy streets or narrow streets. They are committed to transport your belongings in a professional way. Unloading – After reaching the moving truck to your new office unloading process will start immediately. To ensure that every single item is accounted we are taking inventory while unloading. According to your instruction our professional movers will place all the items room-wise with care. As your request or requirement we will also provide reassemble services of your furnitures and other items as well. Unpacking – We always Strives to make your office moving experience more convenient. Bengal Movers will be happy to provide you unpacking service. Our packers are professional and honest, they will unpack all of your belongings and put them in right place by your guidance and instruction. Our unpacking service will help you to settled easily into your new office. As your request we will remove all packing materials from your office after complete the unpacking process. Assembly & Disassembly – We provide disassemble and reassemble services to our customers. We have our expert trained professional technician to assembly and disassembly your office Furniture’s, A/C, LCD/LED, Projectors, Whiteboards, Light, Fan and other electric & electronics items. They will disassemble and also reassemble of various office items before & after your move. For more details about office shifting services or business moving services we requested to make a call at 01777311198 or request us for FREE appointment. Our expert moving specialists are available to assist you 24*7 and will be happy to answer any questions you may have. We look forward to hearing from you and becoming your office moving provider!